The sign outside the venue for this show — a loft space photography studio on Calle César Chávez—proclaimed the arrival of the “Music Academy in the Funk Zone,” and, although geographical hairsplitters might dispute the Zone, there was never any doubt about the Funk. Guests checking in at the door were greeted by Music Academy staff standing behind a nightclub-style velvet rope. Once upstairs and in the space, they were treated to a striking and well-organized presentation of solo cello works by Joshua Roman. At 29, Roman is still a rising star on his instrument, but his formative years as a fellow at the Music Academy clearly prepared him well to take the solo spotlight. 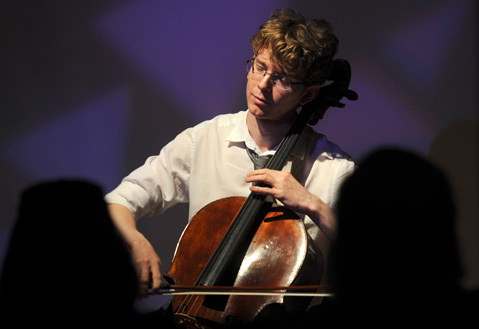 He began with Bach — de rigueur when approaching the repertoire for solo cello. The Prelude and Sarabande from Bach’s Suite No. 6 in D Major sounded sublime beneath the room’s exposed wood beams. Next up was the Sonata for Solo Cello of George Crumb, a great slice of vintage (1955) American musical genius, modernist division. Mark O’Connor’s wonderfully lyrical Appalachia Waltz and the Figura V/Assonanza of recent MAW guest Matthias Pintscher followed, with the Pintscher easily fulfilling the evening’s quota for sonic experimentation. Roman ended the program with a piece of his own called Riding Light, which demonstrated remarkable potential for this performer/composer. The audience, delighted with this new style of musical engagement, lingered long after the music ended, discussing the program and basking in the dawn of a new era for the Music Academy in Funk Zone mode.